Most of the time my process for selecting the next book to read is very transparent, and then other times it seems mysterious. I have a couple of questions that I can’t answer about how I came to acquire and read A Madness of Angels. Where did I first see it? Who recommended it? What was it about the recommendation that caused me to finally buy it? Because I bought it off of Amazon on a whim and read it immediately. Immediately, as in it arrived in the mail at work and I started it at the bus stop. While the other 80 books in the to-read pile stared at me with reproach in their eyes. I CAN tell you that the cover art and the title worked a bit of magic. 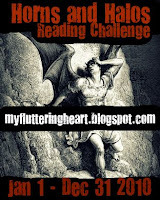 It looked dark and fantastical and like it might just fit in for the Horns and Halos Reading Challenge. Also, though I am always skeptical when blurbs claim that the writing is ‘Gaiman-like,’ I can’t shake the desire to see if they’re right. Kate Griffin (an alias of Carnegie-nominated author Catherine Webb) writes a tale that is bright with vision, reeking with the scent of urban life and bustle and waste, and earsplitting with the sounds of a city’s chaos and rhythm. A Madness of Angels is mesmerizing, smart, descriptive (a bit to excess, on that score), violent, geographical and magical. Matthew Swift (he of the ‘resurrection’) is a conundrum, even to himself. He’s unraveling both the mystery and his sanity, and the journey and chase and characters he meets on the way are the meat of the novel. But a close second is the city of London. Its secrets and byways are both the setting and an entity in and of themselves. The novel is urban fantasy in a very pure sense. It’s so tied to the geography of a particular city that I almost felt like I could take a copy with me and do an A Madness of Angels tour of London. And the madness is catching. Shortly after finishing the book I referred to myself as “we” in front of my roommate. She was tipsy, so the explanation didn’t go over well. But…I’m not sure I can explain this book. I’ll try, though, by referring to other writers. It’s got a bit of the flavor of Charles de Lint’s urban magic, the barest taste of the absurdity of The Hitchhiker’s Guide to the Galaxy, and it follows in the footsteps of Gaiman’s odd and wonderful London Below (in Neverwhere). Add to that a certain horror-flickiness, and you’ve just about got it. Recommended for: fans of horror, dark urban fantasy, superb mystery and danger. Oh, and there’s some solid humor, too. In sum, quite satisfying, and definitely an adult level book. The story continues in The Midnight Mayor. Although a rather unorthodox pick, this book counts for the Horns and Halos Reading Challenge. I'm still of two minds on this one, though I love the magic system in this book. Where magic is and how it's manipulated in this setting is beautifully written. You are right, London itself is almost a character unto it's self. I'll be curioius to see what you think of the sequel. I still haven't read it yet but I plan on doing so. I've seen this one around but didn't know much about it before reading your review. It sounds like fun, I'm going to check if my library has a copy. The cover reminds me a bit of the angels in Supernatural. While I've never read any books by this author, you thoroughly got me intrigued with this one. I might pass this one.Since I'm not a horror fan but I maybe I will since there's some humor in it! I am now intrigued by the mention of De Lint and Gaiman. I might have to check it out. Ryan G: I was really stuck on whether to give this three or four stars at Goodreads. I liked it in the way that I read it as fast as I could and really loved specific parts...but I won't go evangelize this book like I would Neil Gaiman (and by that I mean I'll recommend Gaiman to absolute strangers on the airplane, etc.). You know?